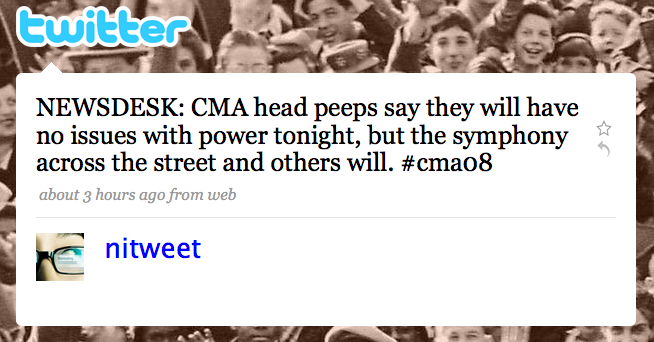 We don’t really know what’s going on downtown… But we do know that it can be pretty accurately described as CMAPOCALYPSE! Our favorite endearing term for the CMA Awards rings a little true today as road closures, gas leaks, transformer explosions and massive power outages have plagued downtown Nashville since early this morning. A gas leak was reported around 8:30am near 3rd & Molloy, shutting down four blocks in addition to the preexisting road closures today. Then a power transformer caught on fire at 6th & Demonbreun, and it was all downhill from there. Many businesses downtown have been without power all day, and may continue to be without power until midnight. Fortunately, the CMA Awards got first priority and the show will go on. WKRN has the full story.